Israel's Mossad spy service scored an intelligence coup in January by obtaining tens of thousands of documents revealing new details of Iran's extensive work on nuclear weapons, including warhead designs and plans for underground testing. The new information was disclosed on Monday by Israeli Prime Minister Benjamin Netanyahu who accused the Iranians of lying about the extent of its nuclear arms work. President Trump said in response to the new disclosures that the Iran nuclear deal, known as the Joint Comprehensive Plan of Action (JCPOA), was "not acceptable" because it permits Tehran to build nuclear weapons in seven years. But the president declined to say whether he will jettison the Iran deal by a May 12 deadline. "We'll see what happens," Trump said. "I'm not telling you what I'm doing, but a lot of people think they know, and on or before the 12th, we'll make a decision." Trump and senior officials, however, signaled in comments that the United States is seeking to renegotiate the JCPOA that has been hailed by former President Barack Obama and his supporters as a significant arms control achievement. Defense Secretary Jim Mattis, considered among the toughest senior administration officials on policy toward Iran, told reporters the JCPOA has flaws. "Right now on JCPOA, I'm giving my advice, as you know in the ongoing decision process that the president will come to closure on soon," Mattis said. "I say that there are parts of the JCPOA that certainly need to be fixed." Last month, Mattis told a House subcommittee that "Iran's nuclear ambitions also remain an unresolved concern." Secretary of State Mike Pompeo, who as a member of Congress voiced vehement opposition to the Iran nuclear deal, went further. Pompeo said the documents obtained by Israel are authentic and provide new information on Iran's secret nuclear arms program. The fact that Iran kept the nuclear weapons archive indicates Tehran was not sincere in concluding the 2015 accord that lifted U.S. and international sanctions on a nation regarded as the leading state sponsor of terrorism. The secretary of state said the Trump administration has held talks with the Europeans about fixing the JCPOA. "We're working diligently to fix this thing," he said noting that language for a revised agreement has been proposed that would "address President Trump's concerns." "We share the same end goal to keep the Iranians from ever having a nuclear weapon," Pompeo told reporters aboard his plane returning from Europe. "I am confident that we will continue to have good relations with our European partners should the president choose to pull out of this. This will be one issue among many of the important, critical issues that we all work on together." The international agreement was reached in July 2015 along with China, France, Russia, Britain, Germany, and the European Union. The agreement was never submitted to the Senate as a treaty to avoid possible rejection. Pompeo said the disclosures by Israel were significant and exposed Iran's failure to fully explain past nuclear weapons activities that was a central tenet of the Iran deal. "The deal that everybody is talking about was premised on the fact that Iran had no such material," Pompeo said. "But Iran bothered, took enormous pains after the nuclear deal and before, but especially after, to hide this information," he said. "It's like an arsenal of knowledge. It's not just in the minds of people whom they have. It's the actual calculations that they've done, the blueprints, the measurements. They kept it hidden because they don't want the world to know what I showed yesterday: that they actually have this capability, a pretty advanced capability, to manufacture nuclear weapons." White House National Security Adviser John Bolton, a former undersecretary of state for arms control and international security, in the past also has favored rejecting the Iran deal, which he has asserted would trigger a nuclear arms race in the Middle East. "The inescapable conclusion is that Iran will not negotiate away its nuclear program," Bolton wrote in a 2015. "Nor will sanctions block its building a broad and deep weapons infrastructure." Bolton instead favored a military strike on Iran's nuclear facilities similar to Israeli action against Iraq's Osirak reactor in 1981 and strike on a Syrian reactor in 2007. Bolton said Obama's fascination with reaching a nuclear deal with Iran had an "air of unreality." "But by ignoring the strategic implications of such diplomacy, these talks have triggered a potential wave of nuclear programs," he said, noting the nuclear arms ambitions of Saudi Arabia, Turkey, and Egypt. In January, Trump agreed to waive key nuclear sanctions on Iran as required every 120 days. The waiver was made under advice from then-Secretary of State Rex Tillerson and then-National Security Adviser H.R. McMaster. Trump fired both officials in March and replaced them with JCPOA opponents Pompeo and Bolton. Jonathan Schanzer, an expert on the Iran program at the Foundation for Defense of Democracies, said the Israeli disclosures likely did little to impact Trump's thinking on the JCPOA. "If anything, they reinforced his views of Iran, it's military nuclear program, and the deep flaws inherent to the nuclear deal," Schanzer said. "The real question is whether these revelations changed the minds of the Europeans, who have been digging in their heels on the question of fixing the JCPOA. We'll find out by May 12 if not sooner." Pompeo said the Israelis are planning to provide briefings on the Iranian nuclear documents cache to government officials in Germany, France, and Britain—all nations that joined the JCPOA. The White House said in a statement Monday night that the information obtained by the Israelis is being studied. "This information provides new and compelling details about Iran's efforts to develop missile-deliverable nuclear weapons," the statement said. Iran's foreign minister Mohammad Javad Zarif said the documents unveiled by Israel were a restatement of old allegations that were addressed by the International Atomic Energy Agency (IAEA). Pompeo dismissed those who said the Iranian documents were not genuine. "I can confirm for you that these documents are real; they're authentic," he said. Asked if Iran's nuclear program, called Project Amad, has been known of for years, Pompeo said "that's partly true." "The existence of the Amad program that ended roughly December of 2003, January of 2004, it is accurate to say that the fact of that had been known for quite some time," he said. "But there are thousands of new documents and new information. We're still going through it. There's still a lot of work to do to figure out precisely the scope and scale of it. But it is the case there is new information about that program." The new information makes clear the Iranians, at the least, have lied to the Iranian people in claiming Iran never sought nuclear weapons, he said. As far as whether the documents show a violation of the JCPOA, Pompeo said he would "leave that to the lawyers." "And the president will ultimately have to make a determination about that too," he said. Pompeo noted that the JCPOA states that Iran will never have a nuclear weapons program and yet Tehran stored the documents. Iran deal proponents sought to downplay the Israeli disclosures by stating that the documents did not reveal new information. Ben Rhodes, Obama's White House deputy national security adviser, said in a tweet that Trump "is about to pointlessly precipitate a crisis that splits the U.S. from our allies and risks nuclear proliferation and dangerous escalation in the Middle East for no reason other than his mindless opposition to whatever Obama did." "By reminding everyone of the well-known pre-Iran deal history, Netanyahu inadvertently made the case for why the Iran deal needs to stay in place," Rhodes added. "Without it, all the restrictions on Iran's program and the inspections regime that verify compliance go away." Rhodes was involved in a public campaign to win support for the Iran deal by creating what he termed an "echo chamber" of reporters and think tank experts. According to the New York Times, Rhodes also misled the public about the deal by falsely asserting Iranian moderates would be assisted by concluded the nuclear agreement. 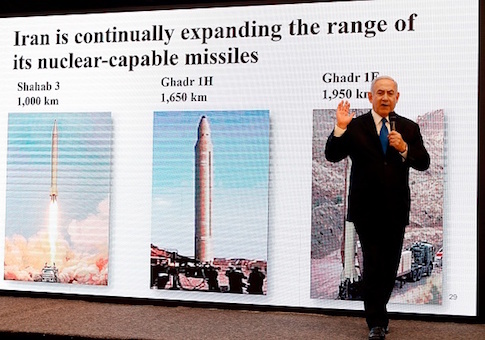 Netanyahu said Tuesday that the new information reveals Iran's nuclear arms capabilities were more advanced than previously known. "It's crucial to understand that the nuclear deal right now that we're discussing is premised on the assumption that Iran will somehow become a peaceful country," Netanyahu said in an interview with CNN. "It's not. It's become, you know, an empire that is devouring one country after the other. And that they're doing before they have nuclear weapons." The JCPO will permit Iran to conduct "unlimited enrichment of uranium—unlimited—in a few years," he said. The JCPOA also does not include any restrictions on Iran's development of missiles capable of carrying nuclear warheads. Storing extensive nuclear arms know-how is an indication the Iranians are preparing to rapidly produce nuclear weapons in the future. Taken together, "that's a prescription for catastrophe," Netanyahu said. The Israeli leader also said JCPOA supporters argued that reaching the deal would result in a more moderate Iran. "So the whole premise that this deal somehow guarantees a safer, more moderate Iran is wrong," Netanyahu said. "This deal paves Iran's path to a nuclear arsenal." John Rood, undersecretary of defense for policy, stated in House Armed Services Committee testimony April 17 that Iran is continuing work on nuclear-capable ballistic missiles. "Iran is extending the range of its ballistic missile systems with the goal of achieving an operational ICBM capability, and through its space launch vehicle program could shorten a pathway to an ICBM because space launch vehicles use similar technologies," he said. The Iranian documents include photos and charts showing an actual nuclear implosion device, a map showing the location of five underground nuclear test sites in eastern Iran, diagrams of a nuclear warhead for the Shahab-3 medium-range missile. The documents also indicate Iran continued to secretly build a nuclear facility at Fordow years after the Project Amad was to have ended. The document cache was exfiltrated by Israeli agents from a warehouse in southern Tehran first identified as the storage site in February 2016, and included 55,000 pages of documents, and 55,000 files on 183 CDs. The New York Times, quoting a senior Israeli official, said the documents were obtained by Israeli operatives in January and smuggled to Israel. The presentation concluded with the conclusion that "the nuclear deal is based on lies." Asked about Israel's nuclear arsenal, Netanyahu sidestepped questions and said unlike Iran, Israel has not threatened to annihilate other countries—a reference to official Iranian statements threatening to wipe Israel from the map. This entry was posted in National Security and tagged Donald Trump, Iran, Iran Nuclear Deal, James Mattis, John Bolton, Mike Pompeo. Bookmark the permalink.